We arrived safe and sound in San Jose, Costa Rica yesterday. Our hotel room is spacious and comfy. Good wifi throughout the hotel. Nice weather so far, sun and clouds during the day, high 25C or 77F, with low humidity but high UV index, and cooler temperature at night makes it great for sleeping. Food and drinks have been very good. I got my exercise hour in the gym today. Will be pleased if I come home without new weight gain! Also lots of relaxing time by the three available pools, one of them has a waterfall. Soaking in the sunshine, listening to the sounds of water, watching the birds, letting my mind wander, admiring the local flora and landscaping in our hotel grounds, sipping Costa Rican coffee in the morning, savouring the fresh fruit here...Pura vida! What else? I've been eyeing a few mango trees outside our windows, all laden with hundreds of mangoes. I've also been speaking Spanish to the hotel employees as much as I can. I felt confident with the basic conversations so my online learning is paying off. Last night I helped out a tourist to get two more plates of food for his family, in Spanish, as the tourist spoke English only, and the waiter spoke Spanish only. Oh and this is my first blog post from outside of Canada! Special time for me to take note. Will post pictures at a later date. Make it a great week, wherever you are! It's been non-stop actions in the last five days as we're getting ready for our trip to Costa Rica. On Saturday, I swam 54 laps in the morning, took my Spanish lessons, did grocery shopping, and notified my credit card companies of my upcoming trip. On Sunday, I ran 5K in the morning, took my Spanish lessons, then did laundry, before going to the Franco-fete de Toronto music festival. The weather was great on Saturday but wacky on Sunday, alternating from sun, to rain, lightning, thunderstorms, then back to sunshine. I attended two concerts at the festival, and in between the two shows, went to view the Summer Arts exhibitions at Harbourfront Centre. There were many interesting vignettes to see and the exhibitions are on until September so I may return for a second look. On the first three days of this week, I did my Spanish lessons, workouts in the gym, yoga, and stretched in the morning, then started packing and buying a few items that we need for the trip. I went through my travel checklist to ensure we have the essential documents, small amount of cash, some snacks, first aid kit, electronic devices, converters, chargers, clothing, and toiletries. For our home, I double checked to ensure all bills are paid, use up perishable items in the fridge, water my house plants, take out garbage, do light cleaning, and have someone pick up our mail during our vacation. This morning I checked in online for our flight to San Jose, the capital city of Costa Rica. I booked this trip back in March and it is finally here! Tonight we're going on a boat cruise around the Toronto Island and Harbour for a graduation dinner party. We’ll be up early tomorrow morning to get to the airport on time for our flight. This will be our second visit to Costa Rica but first time to San Jose. We’re excited, and look forward to having an awesome trip like we did in Playa Grande. As usual, we pack light, one carry-on suitcase and a small day pack each. The weather forecast for San Jose shows daytime high temperature around 25 Celsius (or 77F), mix of sunny, cloudy, rainy days, and isolated thunderstorms, similar to what we’ve been having in Toronto. Our flight will be about five hours long with Toronto time two hours ahead of San Jose time. I'll have plenty of time during our flight to reflect on the first half of 2017 and what's new for the second half of 2017. We’ll return home on July 8th evening. If I have good Internet service during the trip, then I may do a quick post. Otherwise, I’m scheduling my June in a sentence-a-day post to go live on July 6th. Please check back next Thursday for my June review and link-up with other fabulous bloggers who also write their months in a sentence a day. One of the twenty items on my Summer fun list is to attend at least one music festival at home. Toronto is flush with festivals in the summer. Many of them are free to the public. So not to miss one minute of summer fun, this week I attended the Luminato festival which is an international, multi-arts event at venues across the city, from June 14 to June 25. It worked out perfectly in that one of the venues, David Pecaut Square, is within walking distance from my place. I got some exercise by walking to the square, fresh air from sitting outdoors at a picnic table for lunch, and wonderful one-hour musical treats for my ears. I saw the Famous Spiegeltent set up for the evening shows. I googled to learn a bit about the history of the tent and its construction. I didn’t know that only a handful of these unique “tents of mirrors” are left in the world today, and that the Famous Spiegeltent has travelled from Melbourne to Montreal, Brighton, and now Toronto. I was able to attend two free outdoor programs: Guaracha Y Son, an all-Cuban quartet on Monday, and Nick Sherman, a singer-songwriter from Sioux Lookout in Northern Ontario on Thursday. Both performances were wonderful. There were spicy food trucks on Monday, and a weekly farmers’ market on Thursday in the same public square so more to explore and enjoy. Make it a great weekend, wherever you are! Today I’m revealing my Summer fun list and linking up with several fabulous bloggers. Some of the bloggers live in Australia so it is winter for them. While my spring activities have been home-based, my summer activities will be at home and abroad. It's already mid-year, let's have some fun and fill the rest of 2017 with light, love, and laughter! Take a trip to Costa Rica. Enjoy Costa Rica’s “pura vida”. Do wildlife spotting in Costa Rica. Celebrate Canada’s 150 with a BBQ with our extended family. Attend at least one music festival at home. Chill out with my friends with an iced drink, or ice cream in hand. Stroll or picnic in a park. Go to Spain and explore. Travel by train in Spain. Visit up to four UNESCO World Heritage sites while in Spain. Take a siesta to beat the heat. Savour Spanish paellas and tapas. Speak basic Spanish while in Costa Rica and Spain. Tour the Rock of Gibraltar. See the Barbary macaques (monkeys). Play with sand and seashells at a beach. Look for dolphins in the Bay or the Strait of Gibraltar. Stay fit by exercising up to one hour daily. I’ll be posting my progress updates in the coming months. Be sure to check out the linked-up blogs below for more seasonal fun and inspiration. Happy summer! 1. Exercise in the gym three times per week - Yes! I’ve been working out in the gym consistently on Mondays, Wednesdays and Fridays. 2. Practice yoga twice per week. Yes! I do gentle yoga on Tuesdays and Thursdays, mainly to relax and restore from my workouts in the gym. 3. Go for a long walk outdoors once per week. Yes! I mix long walks with 5K runs depending on the weather and how I feel the morning of. Look at the two pictures below...Perfect weather for being outdoors. 4. Learn Spanish online fifteen minutes daily. Yes and am still doing this. I plan to use what I’ve learned when I’m in Costa Rica and Spain this summer. 5. Sign up early for a 5K running race in September. Deferred due to the flooding on Centre Island where the race is to be held. At time of writing, the island closure is extended until July 31. I’ll stay tuned, and if the race is on, I’ll sign up for it. 6. Co-ordinate my parents' move to their new home. Yes all went smoothly just before Good Friday. 7. Meet up with my sister from out of town. Yes. We had so much fun chatting while window shopping in the 1st week of May. 8. Enjoy a family weekend getaway. Yes! This getaway in April now seems so long ago. We have a trip coming up soon. 9. Celebrate two family birthdays. Yes! I remembered to take picture of the red velvet cake. 10. Share some decadent chocolate with my family. Yes as posted here. 11. Call to chat with my friend on her birthday. Yes as posted here. 12. Go for coffee with a friend. Yes at Dineen Coffee and Boxcar Social. Which cappuccino art do you prefer? Cappuccino at Dineen Coffee Co.
13. Write to my friends overseas. Yes as posted here, and by writing to my friends, I reconnected with a former classmate who now lives in Germany. 14. Complete bookings for our trip to Costa Rica in June-July. Yes, it was my first travel plan for 2017. We’re leaving in about ten days. The count down begins! 15. Start booking a second trip for the summer. Yes! I booked our trip to Spain and Gibraltar. 16. Read about my summer travel destinations. Yes and am still doing it as needed. 18. Get a haircut before going to Costa Rica. Yes as posted here. 19. Declutter my closet. Yes as posted on March 26. I haven’t bought new clothes since January so no new clutter (yay!). 20. Donate twenty unused items. Yes. I do reduce, reuse and recycle. I’m super pleased that I completed nineteen out of twenty items. Item #5 is deferred but I have been running 5K on Sundays this spring so I give myself a “Pass”. - Swimming laps on Saturdays: I started with 36 laps on April 9. Small increments of 2 laps per week and here I am at 54 laps. - Completing my condo refresh project which started on April 28 and ended on May 30. The project took a big chunk of my time and tested my patience. I was glad to get it done. - Cooking easy and yummy recipes such as Chicken Sausage Skillet, Sausage and Asparagus Bowl, Beef with Broccoli, and Chicken with Snow Peas. My family approved them all. - Attending more arts and entertainment like A visit to the AGO, Visual arts at Harbourfront, a Piano and violin recital at St. Andrew’s church, Farmers’ market and music, and a Movie with popcorn. The sweet smell of ripe strawberries at the farmers' market made me look forward to the summer even more. I hope you’ve had an enjoyable spring. I’ll be posting my Summer fun list on June 21, and linking up with several fabulous bloggers so please check back and join in on the fun. I recently had a business meeting on the 35th floor at a corporate office building in Toronto. While waiting for my appointment, I took a couple of pictures. It's not every day that I get a view of the city's downtown core from high above, and it was a sunny day with good visibility, too. Sorry for the glare from the ceiling lights. In the first picture, you see the CN Tower (far left), Toronto's Old City Hall, and its clock tower (lower left). Toronto’s Old City Hall is a National Historic Site. The rectangle with the arches is the reflecting pool in Nathan Phillips Square. In the winter, this pool is turned into an ice skating rink. Nathan Phillips Square is where special local events are held such as New Year's celebration, protests, festivals, markets, running race meeting points, etc. In the second picture, on the left you see a skyscraper. It's the Aura mixed-use, residential and commercial complex. At 78-storey high, as of 2016, it's Canada's tallest residential building, and 23rd tallest residential building in the world. Can you imagine living on the 78th floor and ride the elevator to get up or down? Or walking down the stairway of 78 floors when there is a fire evacuation in the building? Toronto's downtown landscape has been changing rapidly. As a local resident, I discover something new daily. Condo developments seem to pop up at every corner, and they get taller, too. Some green space is planned or preserved so it is not all concrete. You can see the green space on the horizon in the third picture. I prefer to be closer to the ground. It's a pleasure to just step out and walk around the neighbourhoods. What is the tallest site that you've visited? Would you live on a high floor, let's say 35th floor and up, for a great view? #9 - Celebrate a June birthday in the family. #18 - Get a haircut before going to Costa Rica. I got my hair trimmed on Saturday. It is low maintenance as I keep my natural hair colour and just have the length shortened quarterly. The various hair stylists that I've had over the years have always told me I have healthy hair so that's nice to hear. I'll keep doing what I'm doing then, LOL. I don't know about you but I dislike the shampooing process at the hair salon. Sitting in the chair and resting my head over the sink never feel comfortable to me. I also dislike the blow drying and styling. Too much heat for my head but my hair does look nicer at the end so I tolerate the heat. With my hair trimmed, I'm almost ready for the summer. I think I'll get a pedicure before we go to Costa Rica. What’s your favourite cake? Do you enjoy going to hair salons? What beauty ritual do you have for the summer? Last night was movie night with our neighbours. We watched Beauty and the Beast on a big plasma screen while munching on popcorn. I used to go to movie theatres frequently and as you can tell from the time the Beauty and the Beast movie was released, I’ve been behind with movie watching by at least three months! I enjoyed everything about this movie, from the music, singing, dancing, to the animations and costumes. Emma Watson is a talented and pretty actress. And the happy ending of the story is a nice start to my weekend! Sometimes I just want happy entertainment, nothing scary or serious. I looked up some stats about this movie. Did you know that Beauty and the Beast is the world’s 10th-highest-grossing film of all time? That’s a lot of money generated. I hope some of it will go to a good cause to make our world a better place. Speaking of weekend, we’ve had a warm and sunny stretch of weather for a few days now. The trees and flowers seem to explode overnight so I’ll be outside enjoying the sunshine and the natural beauty around me. How about you? Any big plan for your weekend? Have a fun weekend wherever you are! Last Thursday sunny weather was perfect for a stroll to the local farmers' market at David Pecaut Square. The sky was clear blue and nearly cloudless, the wind was calm, humidity was low but UV index was high. Time to wear sun protection while enjoying the outdoors! At the farmers' market there were tents sent up for vendors to sell fresh produce, baked goods, cheese, honey, jam, deli, flowers, and quick take-out food. I visited all the stalls, and really loved the sweet smell of ripe strawberries. At 12:30 p.m., Angela Saini and two friends performed her songs for an hour. She had a strong voice and her music was upbeat. The lunch crowd showed their appreciation with loud applause. Such a nice treat to be able to visit a farmers' market on a gorgeous day, and listen to live music for free at the same time. I look forward to doing more of this in the summer. Have you been to a farmers' market this season? Are there similar events where you live? Booked our trip to Spain! Back in March, I booked our trip to Costa Rica for nine days at the end of June. Then April and May zoomed by, and were full of activities that required me to be close to home. With the condo refresh project completed on May 30, I’m eager to resume my travel planning for the rest of this year. We’ll take the trains to travel within Spain. The trip to Gibraltar will involve train and bus. We’ll fly back home from Seville, with a short stop over in Frankfurt. I’m so excited to explore this part of the world. Still have more bookings to do but this is a good start, and it's fun for me to day dream about the destinations. Greetings! Just last month, I had fun documenting my first April in a sentence a day. Today I’m joining other bloggers to write about May. 1. Welcomed Monday, May 1st, with intentions to finish the condo refresh project in three weeks, feeling good after receiving referrals for a good painter, and making a yummy Chicken sausage and kale dinner for my family. 2. Tuesday went well after meeting with a contractor to discuss the scope of work, successfully changed shower head #1, and enjoyed evening time spent with my sister. 3. 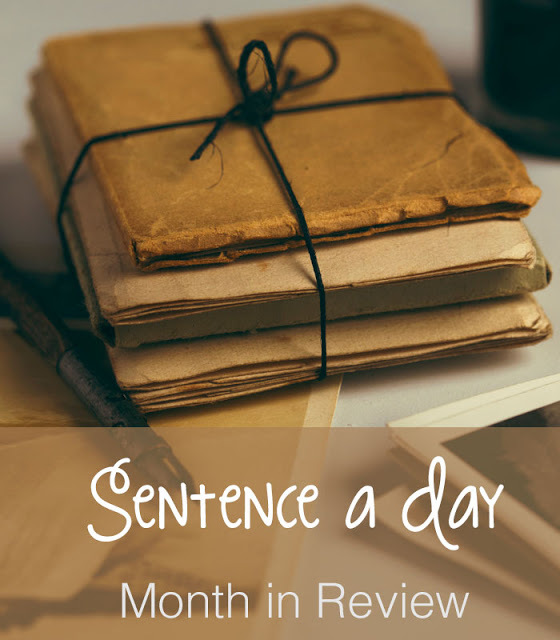 Had fun Wednesday writing up April in a sentence a day, and reading other blogs. 4. More fun on Thursday having coffee and window shopping with my sister, before meeting a painter at the condo for a quote. 5. Rainy Friday, Cinco de Mayo, kept me mostly indoor doing general home cleanup. 6. Felt good Saturday after swimming 40 laps, taking Spanish lessons, and filling up our fridge with fresh groceries. 7. Rounded my 1st week of May with a Sunday 5K run, doing more negotiations with contractors, and writing to my friends in the USA. 8. A great start of a new week with a gorgeous Monday morning, and getting plumbing repairs done in the condo! 9. A Tuesday of two success stories: replacing shower head #2 by myself in the condo, and making a yummy Sausage & Asparagus dinner. 10. A visit to the AGO was a very nice way to spend Wednesday evening. 11. Excited to have the painting started in the condo, even though it’s just neutral grey and white. 12. Checked in with painter and the painting job is going well. 13. Happy to start Saturday with 42 laps in the pool, then headed over to the condo for carpet measure appointment, while the painting got done! 14. Enjoyed Mother’s Day with a 5K run, a post about my 2nd week of May, and a family BBQ. 15. Had concerns about the contractor for the carpeting job...Time for plan B. 16. Enjoyed Tuesday Cappuccino and free visual arts with a friend, and reconnected by email with a former classmate who now lives in Germany. 17. Decisive Wednesday: Cancelled carpeting contractor, and booked carpet installation services with Home Depot. 18. Thursday yoga calmed my mind. 19. Loved the Piano and violin recital at beautiful St. Andrew’s church. 20. Had the pool by myself for the last ten minutes so I kept going to 50 laps, which should balance some of the calories from a buffet dinner with friends tonight! 21. Still waiting for carpet installation date (sigh). 22. Monday is a new day to write my Ten home organization tips. 23. Tuesday excitement: I’ve got a carpet installation date May 30! 24. Wednesday was for writing my 3rd week of May. 25. Heavy rain on this Thursday cancelled my plan to go to an outdoor farmers’ market. 26. Fun Friday lunch with two girlfriends. 27. A productive Saturday with 50 laps in the pool, and stocked up our fridge with fresh groceries, including rapini! 28. Energized my Sunday with a 5K run, then danced to the Caribbean music beat at the Barbados on the Water festival. 29. Pleased to mark a few more items “Yes!” on my Spring list update #2, and enjoyed reading other bloggers’ spring bucket list updates. 30. It's Tuesday and the new carpet in the condo was done in less than two hours! 31. Goodbye condo refresh project, hello travel planning at top speed with a big grin.